In the world, passengers are in a hurry, even though you and I meet, but we always believe that "intention" is the most important core service essence. Attach a small card of about 7*7 cm, please leave a message and ask the designer to write a card (limited to 50 words)~ 📏 Size The overall size is approximately 28 cm wide * 40 cm 🎁 Material Dry plant / paper / ribbon 🌼 flower material Soap flower, rabbittail, foxtail, star flower, amaranth, Casby...etc. Because the actual stock of flowers will vary according to the season, please agree to the designer to replace different flowers of the same color~ 🎁 Packaging This bouquet uses paper lace, silk paper and star-shaped wrapping paper, with Korean multi-level packaging, and then tied with two-color bows of different materials, and finally put about 5~10 pieces of rhinestones, complete! 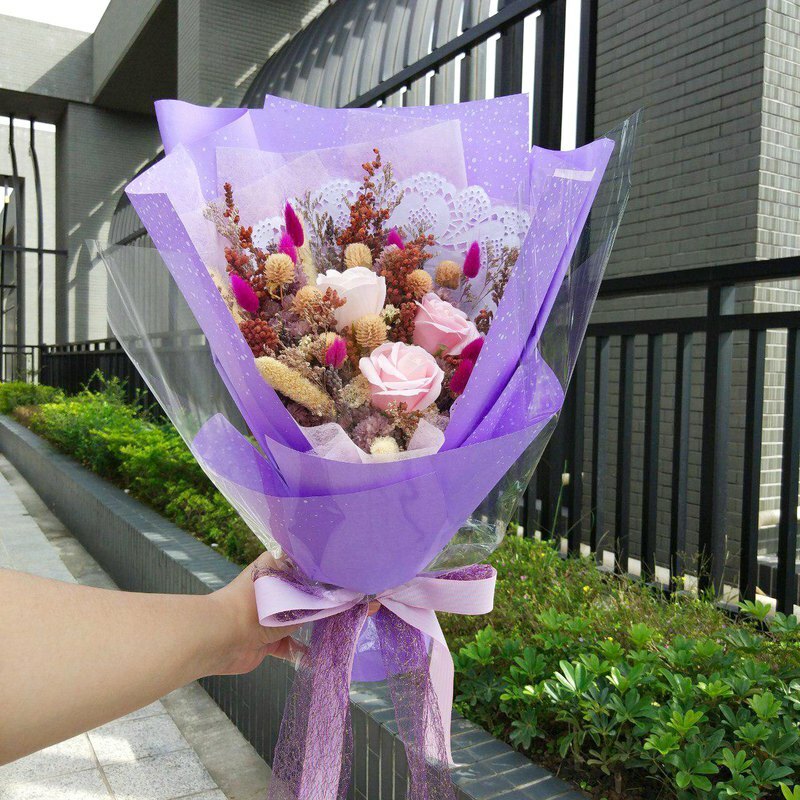 In response to environmental protection, the recycling carton is used in the shipping carton, and the outermost layer of the bouquet will be covered with a transparent plastic bag, which is anti-collision and dustproof. 🚚 【Notes】 1. Due to the different plant growth environments, the product flowers cannot be exactly the same as the photos! However, the designer will try to make the most appropriate matching and adjustment according to the existing flower appearance, and maintain the similarity of 80%~90%. 2. The flower material will be lacking due to seasonal and climatic factors. Please agree to let the designer adjust the equivalent value to replace the flower material. 3. The production time depends on the complexity. If there is no spot, the average shipping time is about 2-3 days. If the quantity is large or needs to arrive at a specific time, please communicate with the designer before placing the order. 4. Dry flowers are fragile and easy to fall. Naturally, the flowers will be properly packaged before being shipped. However, there may still be a small amount of flower drop during the delivery process. Please accept and forgive me. 📣【Dry flower maintenance method】 1. Dry flowers are afraid of direct sunlight and fear of moisture~ If you can put them in a ventilated place, it will be better! 2. The preservation of dry flowers depends on the owner's care status. The longer the storage time, the color faded weathered or the flowers fall is normal! 3. If you find that the dry flower is dusty, you can use the blower balloon for the camera to blow it. You can also use a soft brush to lightly brush it, or use a hair dryer to cut the cold air. ✉ If you have other custom needs and questions, please feel free to ask the designer. ⚠ The above instructions, please be sure to confirm before purchase, to protect their rights and interests, if you can not accept, please do not reluctantly order, thank you for your cooperation!